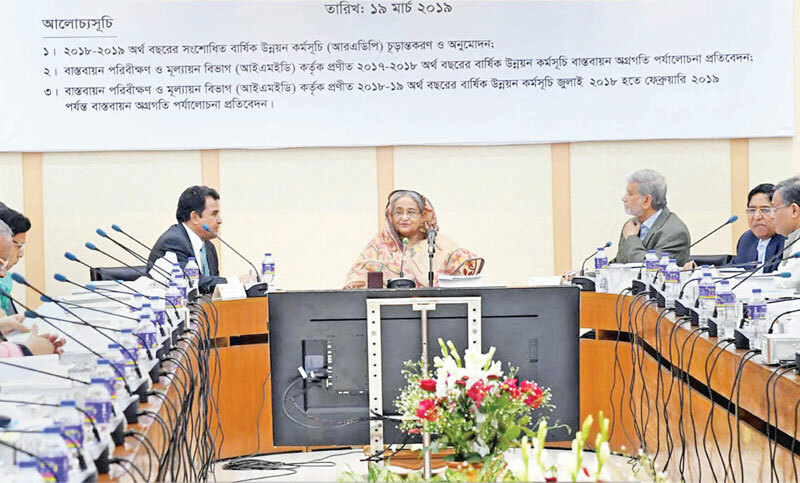 Prime Minister Sheikh Hasina presides over a meeting of the National Economic Council (NEC) at NEC conference room at Sher-e-Bangla Nagar in the capital on Tuesday. National Economic Council (NEC) on Tuesday approved a revised ADP of Tk 165,000 crore (Tk 1.65 trillion) for the current fiscal with a special focus on schemes that have impacts on poverty reduction. The allocation is the same as proposed by the Planning Commission for the meeting held at NEC auditorium with Prime Minister Sheikh Hasina in the chair. A Tk 9,620 crore revised development plan of public corporations was also been approved, which will raise total RADP size to Tk 174,620 crore. Unlike last few years, main RADP size was cut by Tk 8,000 crore from the original allocation of Tk 1,73,000 crore this year, including Tk 1,13,000 crore local money and Tk 60,000 crore project assistance. Project assistance’s share in RADP has been slashed by Tk 9,000 crore to Tk 51,000 crore, while local resource’s share increasing by Tk 1,000 crore to Tk 1,14,000 crore. “RADP size saw cut this year because all the executing agencies could not perform well. Even some agencies’ progress was zero, which was reflected in RADP allocation,” said Planning Minister MA Mannan at a press briefing after the NEC meeting. An embargo on ADP execution prior to national polls and stagnancy in investment during the period also contributed to slow ADP execution, leading to a large cut in ADP, he also argued. The total number of projects in RADP stood at 1,916, including 1,629 investment projects, 154 technical assistance schemes, 2 projects from the Japan Debt Cancellation Fund (JDCF) while the rest 131 projects are for public corporations. The number of projects expected to be complete by June 2019 has been estimated at 345. Transport sector got the highest RADP allocation of Tk 38,040 crore, followed by power sector that fetched Tk 23,225 crore, physical planning, water supply and housing sector Tk 20,378 crore, education and religion Tk 15,468 crore. Rural development and rural institution sector got Tk 15,154 crore, science and ICT 13,353 crore, health, nutrition, population and family welfare Tk 10,902 crore, agriculture Tk 6,918 crore, water resources Tk 5,000 crore, public administration Tk 4,963 crore. The government has decided to intensify IMED’s project surveillance role by opening its office in all the divisions alongside providing necessary logistic support, Mannan informed, quoting Prime Minister’s directive. IMED will have a more supervising workforce, its own pool of engineers, technical persons and technical labs, vehicles for better overseeing project implementations, he also informed. The PM has strongly criticized the practice of not submitting project completion reports (PCR) by executing agencies and asked secretaries to ensure that PCRs are submitted after three months of project completion. She also directed agencies concerned to prepare a project mapping at the district and upazila levels so that ADP projects can be picked up from there, the planning minister informed. The PM also warned against copying project proposals for different regions and directed for avoiding arable land and water bodies for implementing projects without conducting environmental impact assessment (EIA).